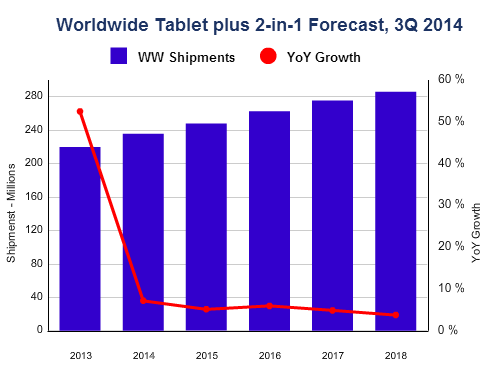 The worldwide media tablet market experienced a significant change in 2014 -- with year-over-year growth slowing to 7.2 percent, down from 52.5% in 2013, according to the latest worldwide market study by International Data Corporation (IDC). At the core of this slowdown is the expectation that 2014 will represent the first full year of decline in Apple iPad shipments. However, both the iPad and the overall market slowdown do not come as a surprise, as device lifecycles for tablets have continued to lengthen -- increasingly resembling those of PCs more than smartphones. "The tablet market continues to be impacted by a few major trends happening in relevant markets," said Ryan Reith, program director at IDC. "In the early stages of the tablet market, device lifecycles were expected to resemble those of smartphones, with replacement occurring every 2-3 years. What has played out instead is that many tablet owners are holding onto their devices for more than 3 years and in some instances more than 4 years." IDC believes that the two major drivers for longer than expected tablet lifecycles are legacy software support for older products, especially within iOS, and the increased use of smartphones for a variety of computing tasks. Among different form factors and product groups, significant advancements have been made recently by hardware manufacturers to advance the 2-in-1, or detachable, Microsoft Windows-based product category. Devices have become thinner, prices have come down, and more models are available. Despite these advances, shipments of 2-in-1 devices are only expected to reach 8.7 million units in 2014, which is just 4 percent of the total tablet plus 2-in-1 market. A large reason for the relatively small uptake has been consumer hesitancy around the Windows 8 platform, which the majority of 2-in-1 devices are built upon. IDC believes that we need to look at how the tablet ecosystem is answering these challenges, and right now we see a lot of pressure on tablet prices and an influx of entry-level products, which ultimately favors the Android open source software approach. Looking forward, according to the IDC assessment, the few unknowns that could impact overall tablet shipments are: the industry reaction to Windows 10; what Google does in this space with Android and Chrome OS; and Apple's rumored product line expansion. Despite all of these unknowns, IDC says that it seems clear that consumers can be expected to hold onto tablets longer than smartphones. One other trend is likely to be constant; Google Android-based tablets will continue to reap the majority of the global market share.